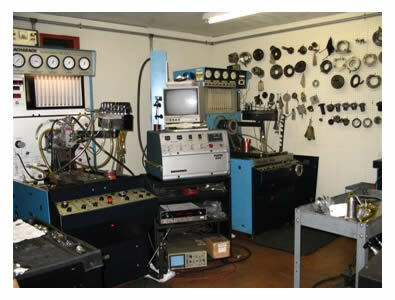 The Fuel Injection/Turbocharger Shop consists of four technicians who use the latest tooling and test equipment to repair and test diesel and gasoline fuel injectors, superchargers, blowers, diesel fuel injection pumps and governors, air compressors, accessory drives, cam followers, rocker boxes, and turbochargers. This department represents OEM manufactures like Ambac, Robert Bosch, Delphi, Stanadyne, Zexel, Alliant Power, Denso, Yanmar, Motorpal, Garrett, Schwitzer/Borg Warner, and Holset. This department stocks a large inventory of parts and exchange units to minimize the customer's downtime. Now testing all common rail injection components. Click below on the following links to learn about more of our capabilities.